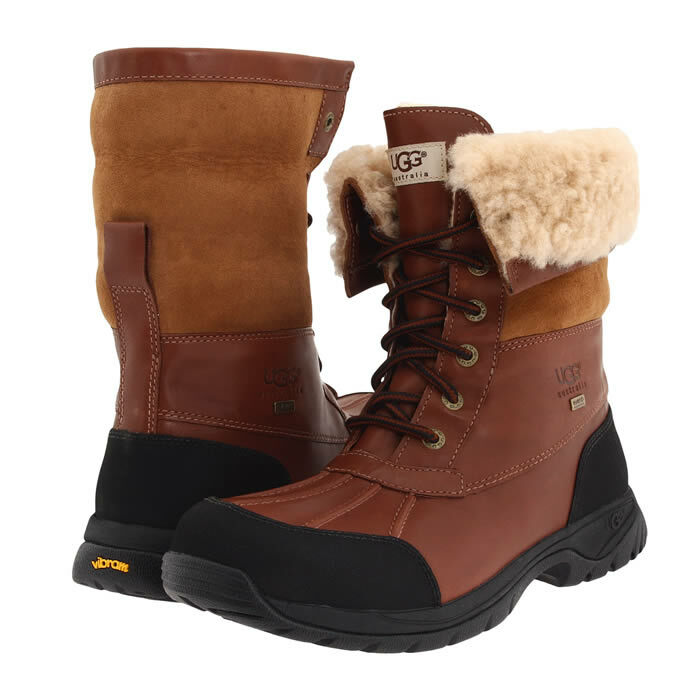 The Ugg Butte is, in many ways, a men’s version of the Ugg Adirondack II—which is a popular women’s boot ideal for lots of walking in cold, slick, snowy weather. The Ugg Butte Winter Boot for Men. More info & prices at Amazon. The Butte, like the Adirondack, provides superb traction due to a Vibram sole and aggressive tread pattern. The traction provided by the Butte is basically identical to what is found on day hiking boots and more traditional winter boots from Salomon and The North Face. Since both the sole and lower part of the boot is made from rubber, the Butte is also easy to clean. The upper part of the Butte is made from full grain, waterproof leather. The leather is soft, durable and—unlike more “traditional” Ugg boots—easy to clean. If you plan on wearing the Ugg Butte in very cold weather for an extended period of time, don’t ruin the superb insulating properties of merino wool by wearing the wrong sock. To keep your feet warm, be sure to either go barefoot or wear a sock made from merino wool while wearing Ugg boots, such as those sock made by SmartWool. More information about SmartWool socks. The Ugg Butte is available at many online shoe retailers. Offline, a few larger departments stores, such as Nordstrom's, also carry the Butte. The Ugg Butte is generally priced around $230, although Amazon usually sells them for less. Other online retailers where the boot is often available include Zappos, Shoes.Com and Shoebuy. Important note when purchasing through Amazon. If you buy footwear through one of the "third party sellers", the purchase does not qualify for free return shipping. Additionally, since Amazon owns Zappos, the prices are almost always identical. Weight : 1 lb 6oz. Upper : Full Grain Leather. Sizes Available : 7 to 18, whole and half sizes. Other Notes : For Men.